I was given this book by the author as a member of Rosie Amber’s Review Team #RBRT in return for an honest review. The Usurper King takes place in an alternate universe where the serial killer Ted Bundy was never apprehended and is now running for president in 2016. Jim, a sufferer of a hybrid computer-biological virus that causes premature aging, tries to pay for his treatments by winning money on the game show ‘Guts!’, which has contestants competitively predict the future by reading animal entrails. For once I’m stuck on how to review a book. Not only because I’m not sure how to describe the genre; The Usurper King crosses both fantasy, humour and political thriller; all mixed up together with some humour that more than borders on satire. The author has a quirky writing style that I admired and there are some brilliant observations on the human condition. Yet parts of the story did make me cringe and skip small sections; those parts were the descriptions on extispicy: (the practice of predicting the future or reading omens by reading the entrails and liver of animals. And yes, it did exist; I looked it up. And yes, I do know I’m a wimp. But here I’m reviewing the book itself so I’ll break it down. As I said Zeb Haradon can write, it’s a fascinating, slightly convoluted plot told in the protagonists’s first person point of view, Jim Galesh; a forty year old, divorced alcoholic who has contracted a disease called TAP: Technologically Acquired Progeria, that is ageing him quicker than normal. This character jumps off the page, he is so rounded and believable, in what is otherwise a fantastical scenario. And, generally, the other characters are multi layered as well. A couple of problems that occurred in places: the pacing of the plot was slightly erratic, and there are punctuation and syntax errors throughout. 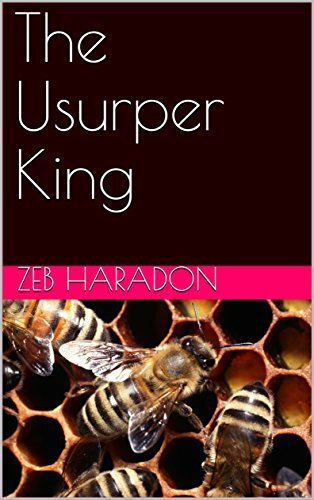 This entry was posted in authors, blogging, Book Reviews, Books, Fantasy, Review, Thriller and tagged #RBRT, #tuesdaybookblog, books, humour, The Usurper King, writing, Zeb Haradon by Judith Barrow. Bookmark the permalink. Intriguing! I want to read it for myself now to see if I agree! Would be interested to read your views, Linda. It has had a couple of cracking reviews. Most intriguing, Judith. My son, Greg, was telling me the story of Ted Bundy the other day in the car. This sounds a little bit like Dead Zone by Stephen King. Greg said that Ted Bundy was the most famous serial killer of them all [I thought it was Jack the Ripper but I am way out of date]. He killed a large number of college students at three universities. Greg is a mini genius who knows everything [smile]. Judith, you definitely have me intrigued. I’ll have to pass on the topic, fascinating as it is… Ted Bundy was so much like my sociopath ex-husband that… I can’t even think about it. Actually, learning about Bundy and seeing the strong similarity was one of the things that finally made me take the drastic steps I had to make in order to get away. Thanks for this honest review. Hugs.